Selection Indices combine traditional expected progeny differences (EPDs) with economic values to give a more complete view into how an animal’s progeny performance will impact the bottom line of an operation. Since EPDs have been implemented, they have been used to make both wise and unwise selection decisions because many ranchers tend to “single trait select” for traits that are perceived to have greater value. An example of this would be picking bulls with high Yearling Weight (YW) EPDs for the purpose of increasing the finish weight of steers coming out of the feedyard. True, you will significantly increase the pay weight of the steers but the unintended consequences of this decision is that the rancher has also increased the mature weight of the heifer mates to the steers. This increased mature cow size leads to a greater feed costs in the cow herd, increased cow maintenance costs and possibly decreased conception rates, if the cow’s nutritional needs are not met. By using the appropriate selection index, ranchers can avoid single trait selection and more accurately improve the trait(s) that impact his profitability. To get the most out of indices, it is important for the rancher to know his scenario and select animals that best fit those production parameters. $T or Terminal Index is designed for the retained ownership cattleman, feeder cattle buyer or packer who is most interested in fast growing, high performing steers, who will be sold to the packer on grids based on carcass merit. $T is a combination of WW, YW, REA and IMF EPDs. These traits accurately tell us about the growth and carcass merit of that animal. When these are combined with historical Choice/Select and Yield Grade pricing components, they give a very accurate description of the future value of a bull’s steer progeny. While the individual EPDs describe certain traits very well, the index does a better job of selecting for all of these traits at the same time. Sire A $T $110 – Sire B $T $53 = $57/head difference in value between progeny of the two sires, for this scenario. The $57/head value difference is a combination of the expected growth and carcass value of the steers. 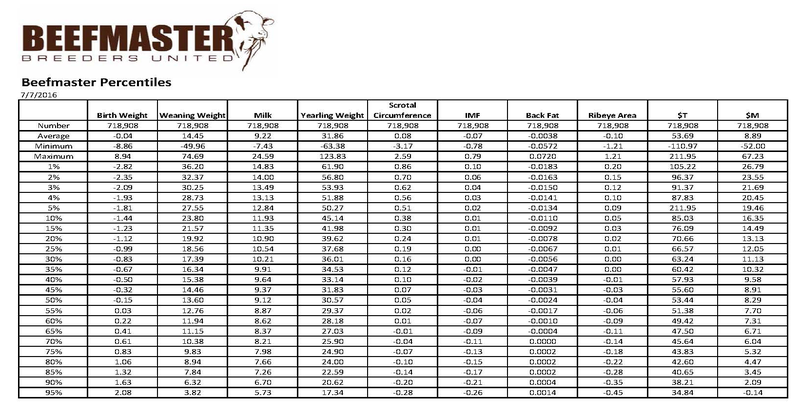 This is powerful information because the rancher can discern true value differences between sires. Sire C $95 - Sire D $47 = $48. We would expect Sire C’s progeny to earn an additional $48/head in value versus Sire D’s progeny. Again, this is a combination of growth and carcass merit as indicated by their EPDs and balanced by the $T index. It is very important for the buyer to understand that $T is designed to reflect a scenario where keeping replacement females is NOT considered because Maternal traits can often times be at odds with Terminal traits. $M or Maternal Index is designed to help ranchers select animals that fit into a maternal criteria. Dr. Matt Spangler of the University of Nebraska describes $M as the $ profit per cow exposed due to calf weaning weight accounting for costs associated with cow maintenance. Unique in the industry, $M accounts for growth, milk production and fertility and considers expected cow maintenance issues to arrive at an economic figure that is meaningful to the cowman. The EPDs considered and factored into $M are WW, YW, Milk and SC. These are balanced against cow maintenance costs as a result of mature cow size and milk production. Sire A $M $19.46 – Sire B $M $8.29= $11.17 in additional profit from daughters of Sire A due to their ability to balance growth, milk production and cow maintenance costs. While $11.17 per cow may not seem large, keep in mind that if that cow stays in the herd for 10 years that will translate into an additional $110 over the lifetime of that cow. In a margin driven industry where costs are important, that is an important figure. Sire C $M $15.16 – Sire D $M $4.23 = $10.93 in additional profit from daughters of Sire C.
It is important for users of these BBU Indices to understand the assumptions for $T and $M and use them accordingly. If a buyer is interested in only growth and carcass merit and is not planning on keeping replacement heifers, then $T is a great tool that will add to the rancher’s revenue generating power from the sale of steers to the packer. Conversely, if the rancher is selecting bulls to produce replacement females where their progeny will be sold at weaning, and the ultimate long term goal of making a profitable cow herd focused on balancing growth, milk and fertility with cow costs, then $M will be a valuable guide in identifying those genetics.